Almost a year ago, we saw the Extra Supermarket in Maplewood. Extra is a five-store chain with locations in Maplewood, East Orange, and Jersey City, and two in Newark. 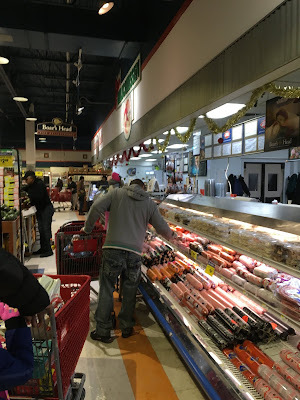 Maplewood, East Orange, and the Lyons Ave store in Newark share a website and circular, while the Avon Ave store in Newark and Jersey City share a different website and circular. Their store in Jersey City is the largest. 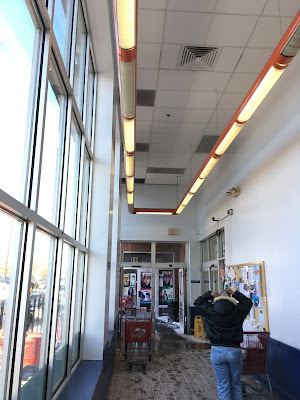 UPDATE: Since writing, the Maplewood/East Orange/Lyons website has been disconnected, and the location in Elizabeth, NJ has opened under the management of Avon/Jersey City. The new website is here. So now Avon/Jersey City/Elizabeth has two websites and Maplewood/East Orange/Lyons has none. Great! This store was constructed in 2000 as part of The Hub Shopping Center in a lower-income neighborhood of Jersey City. Expected to revitalize the neighborhood, The Hub has the asset of a major supermarket as the anchor. However, it's been otherwise unable to keep tenants for an extended period of time. 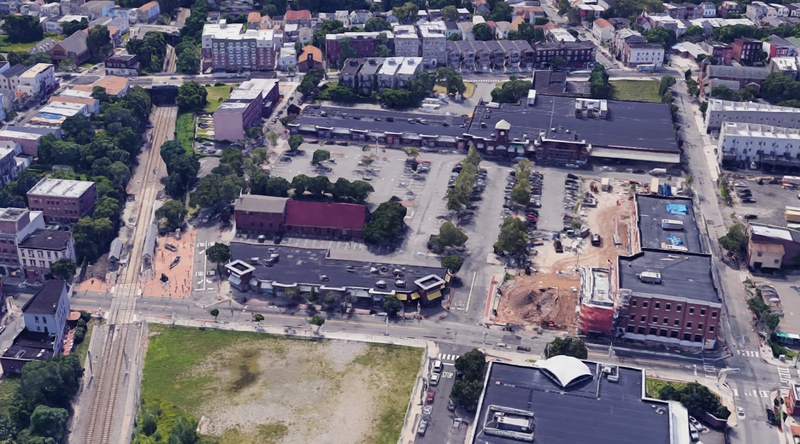 More recently, however, an annex to the Jersey City city hall has opened in the complex, which once again is predicted to revitalize the area. Although the area has gotten better over the years since The Hub opened, it's hard to tell whether that's a result of the development. Google Maps view showing the entire shopping center. The supermarket is visible to the top right, with the new City Hall annex in the bottom right corner. The MLK Drive lightrail station is in the bottom left corner. In the above Google Maps street view, you can see the new City Hall annex with the Extra Supermarket visible in the background. This supermarket was previously CitiMarket, New Jersey's first and only major African American-owned supermarket. Unfortunately, CitiMarket closed within two years of its opening and was taken over by the Hispanic-owned Extra chain. At more than 50,000 square feet, this new-build supermarket has a lot to offer, including a food court, service seafood, a butcher, a deli, and a pharmacy department. It's partially set up like an indoor mall, as some Pathmarks were, with smaller businesses lining the left side of the building. However, most of these businesses are closed. You enter to a foyer in the front, with produce lining the left side of the store and pharmacy, deli, and seafood in an island to the right. Grocery aisles continue past this island. A small baked-goods section is located at the back of the first aisle and meats continue along the back wall, with frozen and dairy at the far end of the store. Customer service is immediately to the right of the entrance. With that, let's head in! The foyer here is very bright, but certainly not from that light fixture. And in Extra's defense, the floor was only dirty here because I visited in January 2018 and there was salt all over the ground. The entrance is visible on the right-side wall ahead, with the exit just behind me to my right. We're looking towards the back wall here, with the deli/seafood island to my right and the side wall to my left. There is a small seating area behind me. Here you can see the seating area in the front, as well as some of the smaller businesses around the perimeter of the store. They are separated from the produce department by a clear panel wall, which you can also see here. The deli is pretty large, and sells a good selection of Boar's Head and other brands. The produce department is large but has a surprisingly small selection (with no organics), but even what was there was on the expensive side and not particularly fresh. Produce is probably the store's weakest department, unlike the Extra in Maplewood. On the other hand, there were some good sales, like these huge Florida avocados on sale for $2.49. Not much fried chicken around here anymore, though. The entrance is just to the right and the hot food counter is around the corner from this case. Looking up along the deli case towards the back wall of the store. Bulk dry produce, like potatoes and onions, line the side wall in front of the closed storefronts. Behind the potatoes and onions there is a walkway accessible from the front of the store that offers access to the storefronts. An overview of produce, looking up towards the front of the store. So let's start by overlooking the broken a in "Extra" and s in "Produces". And the fact that "produces" is not, in this context, a word. Notice that "Extra" doesn't really fit in to the outline that it's located in. Now picture the same sign with the word "Citi" in place of "Extra". Aha! If you scroll back up to the picture of the deli, you'll notice the same thing. Here's a look at the seafood department in the back of the grand aisle. It might be run by an outside vendor, although I'm not sure. (The pharmacy is.) Very nice display, and each fish is clearly marked (even color-coded!) wild caught or farm raised. Many stores don't mark the distinction as clearly. The seafood department looks newly renovated and is nicer than most of the rest of the store. That's one of the reasons I think it could be an outside vendor. The bakery is just to the left here, with produce behind me. The first aisle would have originally been health and beauty, which has been downsized to a few shelves behind the customer service counter. Although there is a prescription pharmacy department, otherwise the selection of HABA is quite small. The first aisle, which is double-wide in back (shown here), is now one of the international aisles, along with some kitchenware. This is the back of the seafood/deli island. This sign feels out of place, for a store like Extra. First off, it's not the type of thing Extra or similar stores will typically hang in the first aisle for no apparent reason. Second, Extra's management, staff, and customers are predominantly Spanish-speaking. So why bother putting up this sign in the first place, and if you have to, why print it in English? Not that it's not a nice thought, though. The pharmacy is located in this bumped-out section. This sign doesn't make so much sense anymore, given that there is no longer any pharmacy-related stock in this aisle. The service pharmacy counter, closed on the Sunday afternoon I visited, is at the front of this aisle and faces customer service. This is up there for the worst pictures I've ever taken. The pharmacy counter is behind the window to my right and the hot food counter is just around the corner to the right as well. Checkouts continue to the left of customer service along the same wall. A look along the front end. Packaged meats line the back wall of the store. There's a coffin case with more meats visible on the right side of this picture, which makes me wonder if there was a second where these pallets of water and other goods are now. Looking back towards bakery and produce. Strangely enough, the service butcher counter is at the far end of the back wall, near dairy. Usually it's on the produce/seafood side of the store. Milk and eggs are located in the back corner of the store, with dairy continuing down the last aisle. The second-to-last aisle is frozen foods. Spacious frozen aisle. Given the overall lack of natural and organic products throughout the store, I was very surprised to find a large selection of frozen meat substitutes for pretty low prices. That felt very out-of-place. So did these Piggly Wiggly waffles, although for a different reason. You can see on the left here that the decor is beginning to fall apart in some places. In the last aisle, the walls aren't illuminated well, although the walkway and products are. The bread was pretty cleaned-out, but the store was also packed with people when I arrived, so I just missed the big rush. The front corner contains sale and bulk items, but it looks like it was designed that way. There probably wasn't ever anything else here. The front end is very spacious and pleasantly clutter-free, for the most part. There are plenty of registers, and enough of them were open. You exit to the left in the above picture and go back out through the foyer. 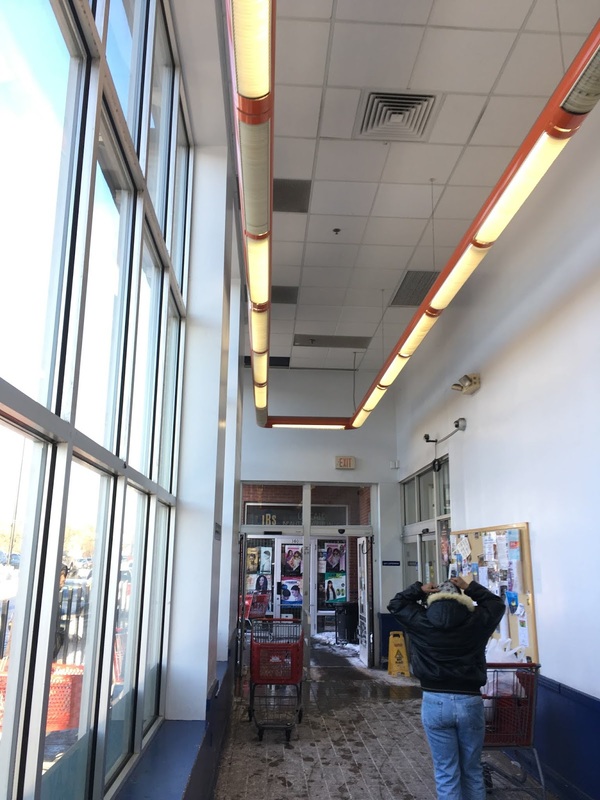 ADDITIONAL UPDATE: As of September 2018, a renovation has begun at this store. It's hard to tell the scope of it so far, but the decor in the produce department has been swapped out for a much more modern design. HOLD EVERYTHING, ONE MORE UPDATE! Reviewing my pictures now, it looks like the remodel was already in progress when I visited! Compare this November 2016 photo to my photo. Notice that the awnings with the Extra logo had been removed. Usually, the first step in a remodel like this is to strip the walls, which I guess they were already doing.